I am forever a fan of kitchen tips, tricks, short-cuts and all manner of making the most of time, kitchen tools, food scraps and in general: hording culinary wisdom. Last week was my kiddos spring break, which was a nice time for us to snag some away-from-the-city time to regroup, relax and reorient. It was deemed a bit of a working vacation; my sons had some online math to finish, my husband worked remotely (ah the mixed blessing) and I burrowed through a stack of food magazines. I mean not to keep so many. My latest remedy is to go through magazines, page by page, and rip out recipes or articles of interest. I file them: recipes, dinner parties, ideas for writing articles. A few pages are torn in the name of art projects, and a few more for travel and home decor. It may sound daunting, but when the magazine carcasses land in the recycling bin, they are usually only less a few pages. A stack of 10 magazines leaves me with only a thin file; one must be discerning, after all. In case you are curious, the magazine pile was thick with Food & Wine, Fine Cooking, Saveur, Bon Apetit, Cuisine at Home and Budget Travel. 1. You know those little generic bottles you can buy, the 3 ounce bottle from your drugstore? They are meant for filling with liquids, the right size for air travel. Here is a thought: fill them with salad dressing and tuck them into your lunch. 2. If you are a friend of the environs, consider paper cups and plates made from recycled material. Bagasse cups and plates are made from a byproduct of the sugarcane refining process and biodegradable, when you are finished this dinnerware is more than comfortable in your compost heap or recycling bin. Find at www.branchhome.com. 3. New uses for old things: reuse yogurt containers for seed starters. Plant your seeds in yogurt containers this year, until the frost settles and you can replant them outside. 4. New twist on your martini: instead of olives, garnish your martini with a sprig of spring: drop in a budding lavender or stem of thyme. 5. Easier to fill pork loins: make your filling (the magazine used the example of duxelles---minced mushrooms and shallots sauteed in butter and lightly seasoned), then roll it in a long cylinder in saran wrap and freeze. 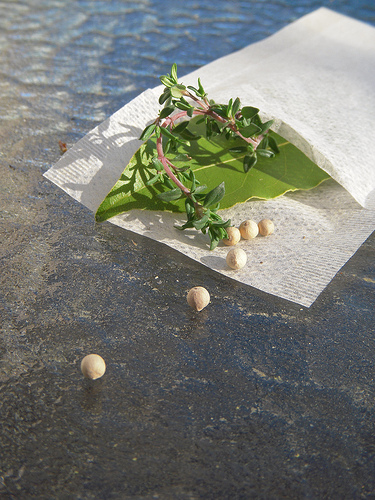 When time to make pork loin or steak loin, butterfly the meat, place duxelle in center and roll, securing with string. Great for make-ahead meals. 6. Hold your cutting board in place/on the counter with a silpat or whetted paper towel. (We did this daily in culinary school; this habit followed me to my home kitchen). 7. Over baked cookies? If your cookies turn out too hard for your liking---but have not yet caved to the impending burn flavor---use them anyway. Crumble them or coarsely pulse them, then keep these delicious morsels to sprinkle on ice cream, yogurt of fresh fruit. 8. If you make chicken stock: a great way to degrease the stock is to freeze slotted spoons, then run it across the top of the stock. The fat will congeal on the back of the spoon while the stock passes through the spoon's slots. One pass is ample, after that the spoon is too warm for the same effect. 9. Scooping out squash? Use an ice cream scoop to gather the coveted squash flesh. Same goes for twice baked potatoes. 10. Making stock, stew or braise and using a sachet d 'epice (typically cheesecloth filled with herbs and spices)? Use single serving, pre-made tea bags, instead of cheesecloth. The tea bags are already in a 'pocket' ready to be filled and dipped in---and out---of your stew. May 8 because it is tough meat, that is why. Jul 22 Just a little, helpful idea for your culinary toolbox. Mar 13 Quick tips for the kitchen.